I've been working on this a bit. It's using up some remnants of a jelly roll from another quilt. It'll be a great, bright table runner.And it's part of my efforts to bust some stash. 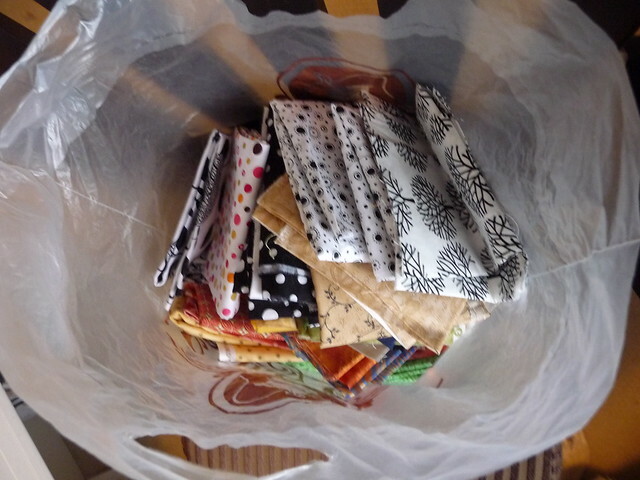 Although since I bought the black batik you see in the picture and have about a 1/4 yard left of it, I don't know if I can consider this successful stash busting. But it used up some of my strips. And cutting into all of these bits of fabric has created MORE strips. Some I'm still hesitant to chop up, especially if there's quite a bit there. All of this started when I decided to clean up my quilt room. Scraps were overflowing the several areas they were stored in, fabric was slipping and sliding off the shelves, and I keep losing and finding the same owl applique quilt. And I have some of the ugliest fabric ever created (not pictured above). So it was time to do something. It started with an hourglass quilt. Hourglass quilts are so pretty, right? 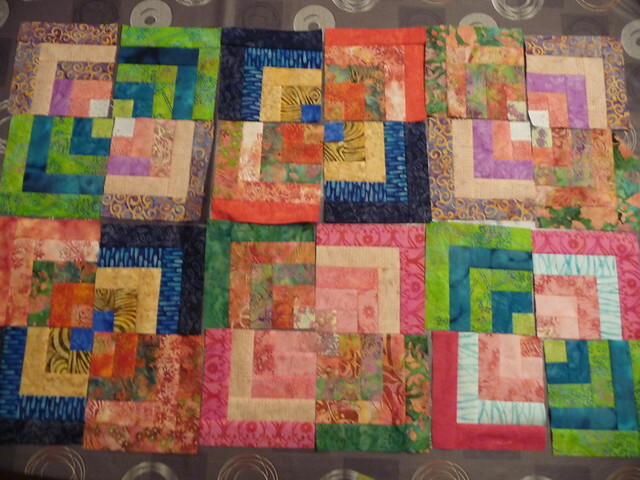 I need 332 (I think it was) 4.5" squares for the one I'm planning. And I think that's just a twin size! Although since the pattern called for 4.25" squares and I didn't realize that until it was way way way too late, I'll get a size gain there. 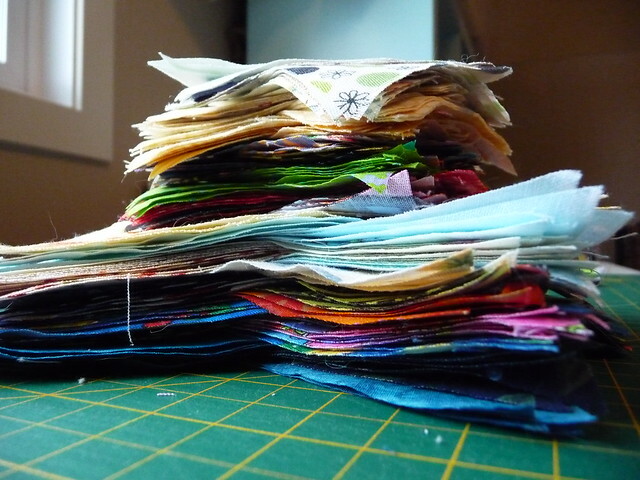 As I was cutting, I realized I had more scraps that I could use in that one single quilt. So I started cutting for the second quilt I was dreaming about - wedges. So that took care of 8" strips and 4.5" strips of fabric. Sometimes I was left with smaller strips of fabric though and I couldn't leave those out, right? So I dug out a pattern for a Thousand Pyramids-type quilt and started cutting 3 and 5.5" strips. I've spent the last two weekends basically cutting out fabric. Shattered was quilted because I needed a break from cutting. The log cabins at the top were pieced because when Mom was up, she needed to use the cutting board too sometimes. And I really liked those batiks. Now I'm stalled because I need sashing and border fabric and I can't imagine going out to buy MORE fabric when I've got all these quilts cut out and ready to go. Well, ok, not completely cut out. I still need another hundred or so 4.5" squares, probably about the same in triangles and the 8" strips haven't been cut into wedges yet. Cutting. I've been doing LOTS of cutting.